Our single wall cardboard boxes are made with top quality cardboard, and come in a variety of sizes tailored to meet your shipping requirements. Supplied as flat-packed, the boxes require minimum storage space until they’re used, yet deliver maximum performance when it comes to presentation and reliability. With a range of dimensions to choose from, there’s sure to be a single wall box to suit the task and your pocket, whether you’re shipping, storing or moving. Next parcel collection is in 3 days 12 hrs 5 mins Buy before then to get free UK Mainland delivery, for the next working day. Size: 20" x 6" x 4"
Single Wall Cardboard Box (178 mm x 127 mm x 127 mm) 7" x 5" x 5"
Size: 7" x 5" x 5"
Size: 18" x 12" x 12"
Size: 5" x 5" x 5"
Size: 6" x 4" x 4"
Size: 6" x 5" x 4"
Size: 7" x 7" x 10"
Size: 7" x 5" x 2.5"
Size: 7" x 7" x 5"
Size: 9" x 9" x 6"
Single Wall Cardboard Boxes (229 mm x 152 mm x 102 mm) 9" x 6" x 4"
Size: 9" x 6" x 4"
Size: 8" x 6" x 2"
Size: 5" x 5" x 2.5"
Size: 6" x 4" x 3"
Size: 8.8" x 8.8" x 4"
Planning a therapeutic reorganisation of the clutter in your life? Our single walled boxes are a cost-effective solution to finding all that noise around you a new home, and keeping your prized possessions in mint condition until the next time they’re needed. If you can’t see exactly what you’ve been looking for, why not try our Box Finder? 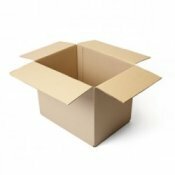 Simply enter the dimensions of the items that need boxing up, and we’ll show you all the suitable boxes that match your requirements.